On June 5, a dynamic and excited group of Lyndon Township residents, board members, and planning commissioners joined HRWC to learn about the forests, fields, wetlands, and waterways that make up their township’s Green Infrastructure. Green Infrastructure is the network of natural lands, working landscapes and other open spaces that conserve ecosystem values and functions and provide a whole host of benefits, including clean air, filtering pollution from water, providing drinking water, flood prevention, temperature control, and other less tangible benefits such as enjoyment of hiking, fishing, paddling, and other outdoor activities. Green infrastructure exists from this broad landscape scale of mapping out and planning around large natural area networks, down to the parcel/site scale of installing rain gardens and other natural vegetated forms of stormwater control. In fact, HRWC’s latest Huron River Report has an article about the smaller scale green infrastructure. Thanks to funding from the Consumers Energy Foundation, HRWC is working with communities to develop Green Infrastructure plans to guide their future land use and development in a way that is in concert with their natural ecosystems. The program is modeled after Oakland County’s Green Infrastructure Program. The county worked with each of its 62 local governments to map out natural areas, recreational opportunities, and linkages between them, and then create Green Infrastructure plans. Lyndon Township is the first local community in the Huron watershed to begin the planning process. 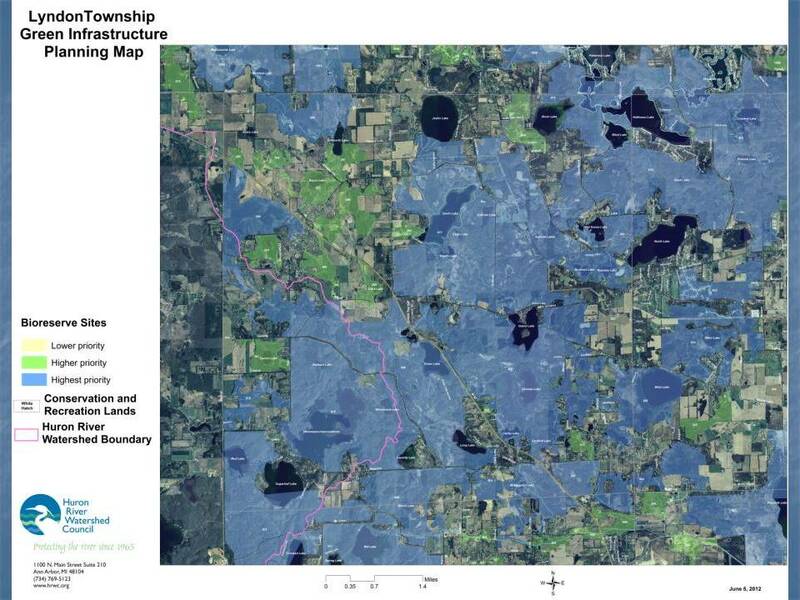 The Lyndon group gathered over HRWC’s Bioreserve map of Lyndon Township forests, wetlands, waterways, and fields, markers and post-it notes in hand, and together designated larger intact natural areas as “hubs,” smaller areas as “sites,” and then created linkages between all those sites. In addition, participants added post-it notes of special places such as known massasauga rattlesnake habitat, high quality fens, and even threats such as a proposed gravel pit. HRWC will add information gathered at the meeting to our existing GIS computer map of Lyndon’s green infrastructure and create a draft green infrastructure vision map and plan to present at a Fall meeting with the group. The township will then use the plan and map to guide their land use planning decisions about where to direct location and design of new development as well as for greenway and trail planning.